Blog National Dog Day is Today, August 26th! 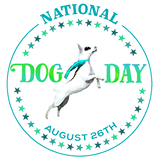 Wednesday, August 26th, 2015 is National Dog Day! Adopt a dog from your local shelter or pure breed rescue organization. Volunteer at your local shelter and offer to walk a dog or play with a dog, clean cages or anything else they need help with. For more ideas on how to celebrate National Dog Day, visit the National Dog Day Website!